Not too long ago, we launched our series Caliber Spec with our first installment focused on the venerable ETA 2824. Today, we’re following up with an article that will take a look at the 2824’s primary competition. From Sellitas and Seagulls on one end, to Seikos and Miyotas on the other, we’ll go through some of the most ubiquitous calibers—all peers to the 2824—currently on the market. Imagine if you had a choice. Imagine if you could walk into your local Jaguar dealer and drive out in a V6 Supercharged F Type for a gnat’s whisker under £71,000. Alternatively, you could stroll into the Kia dealer next door and buy an identical car but with a Kia badge for, let’s say, £30,000. What do you do? Which car do you get your checkbook out for? It’s a question of brand, isn’t it? I’ll bet a lot of people would look to check no-one was watching, then plump for the South Korean model but feel, somehow, it wasn’t quite all it should be. And it’s the same in Watchworld. Strangely, watchies are sniffy enough about makers dropping standard ETA 2824-2 movements into their cases. There’s still the feeling that in-house is somehow better than an off-the-shelf movement from Switzerland’s biggest movement maker. Lord alone knows what collectors will make of Sellita’s SW200, Miyota’s 9015, and Seiko’s 6R15 gaining ground on ETA. Sellita powering the Oris BC3 Advanced Day Date. This is very much a new phenomenon. The idea of an “in-house” movement would have been very strange and caused no end of raised eyebrows in eighteenth-century La Chaux-de-Fonds. Back then, dial makers made dials, case makers made cases and movement makers madexyou got it—movements. Watchmakers then assembled the components. So, they were absolutely used to getting the best movement they could find economically and fitting it inside a case. If you’d asked an eighteenth-century maker about in-house movements, he’d have looked at you as though you’d been on the Goldschläger. So, which movements are taking turf from the workhorse 2824? The Sellita comes from—to all intents—the same Swiss stable as ETA’s venerable 2824 (for some added context, it should be understood that for many years Sellita held an out-sourced assembly agreement with ETA). The Miyota is a different animal. It’s a completely different design and comes from further away, in Japan, where they turn out around 1.8 million mechanical movements a year. Others start life in China.But in practical terms, apart from the ETA name on the base plate, what are you missing by picking up a watch powered by the Sellita or the Miyota? 9015 with a custom rotor engraving. In fact, the Sellita and the ETA are almost identical, all bar the addition of a 26th jewel on the top of the barrel arbor near the ratchet wheel. This should reduce the friction from the self-winding process. As the ETA has never had any particular problems around friction in its self-winding mechanism, it seems this is rather more of an attempt to create a superficial engineering difference that’ll keep the marketing department (and perhaps a few customers who want bragging rights) happy. The differences between the two movements are so tiny that, sans logos, a lot of collectors would struggle to know whether they were looking at a 2824 or a SW200. If you were picky and particularly eagle-eyed, you’d spot some differences around the base plate, but that’s about it. Both hand and self-wind, hack, beat at 28,800bph, and turn up in a range of finishes. It’s likely that both movements will stand the test of the years, too. We already know the 2824 is as well-built as an old Volvo 240—solid, sound, reliable, and constant. It’s worth a bet that the to-all-intents-and-purposes-the-same Sellita is likewise. So what about that Far Eastern import, the Miyota 9015? For a start, you’ll not muddle a Miyota with an ETA or Sellita. They’re different designs. The large central screw that holds the self-winding rotor of the ETA/Sellita is replaced with three smaller screws. ETA’s rotor runs on five tiny ball-bearings. The Miyota runs on seven. Strangely, it also runs rather more loudly—you’ll know when the rotor is spinning. Not in a 7750 sort of way, where the rotor almost seems to have a life of its own, but you’ll certainly hear and feel it. Where the ETA and Sellitas’ rotors are made from a single piece of alloy, the Miyota has an inner rotor plate with a riveted outer weight at the rim. If one was being blunt, the Japanese movement looks and feels a little more basic. The accuracy claims mirror the looks. The 2824 is famously simple to regulate, even to a degree of fine accuracy that embarrasses smarter, more expensive motors. The Miyota, despite the balance beating at the same 28,800 vibrations per hour as the ETA/Sellita, claims only 10~30 secs per day. The Miyota is slightly slimmer though—0.6mm thinner than the ETA that’s a (relatively) chubbier 4.7mm high. Another series of Japanese workhorses start life in Seiko’s 6R stables. You’d probably not take a 6R home to meet your mother, but despite the utility aesthetic, it’s a fine movement. The base 6R15 (sold as the NE15 by Seiko to third-parties) ticks at 21,600bph with the other four movements in the series (the 20, 21, 24 and 27) running at 28,800. It’s all powered with the wonderfully 1950s sci-fi named “Spron” mainspring. Spron is a Seiko in-house alloy that’s resistant to bending out of shape and fatiguing. Take a Spron hairspring, stretch it and it’ll happily spring (sorry) back to its previous shape with no drama, fuss or deformation. Don’t try that at home with a standard balance or mainspring. NE15 front . . .
It’s not too hard to see the R’s evolution from the more basic S series; the winding train is different but, apart from that there’s no need for a paternity test. From the mid-1990s, Seiko have taken the movement through various generations, adding new parts and capability. But Sellita, Miyota and Seiko aren’t the only ones competing with the 2824. The old Duchess is hedged about with claimants to her title. There’s the STP1-11 from Swiss Technology Production or STP (no relation to the racing octane booster) from Fossil, based in Manno, Switzerland. Like the Sellita, the STP has 26 jewels, runs to 28,800bph, hacks and self/hand-winds. It’s different in that its standard level of finish sees proper perlage on the plates, giving it a few bragging rights over even the 2824. STP1-11 in a modern Zodiac Sea Wolf. Travel rather further to China and you could swap your 2824 for a Hangzhou 6301. 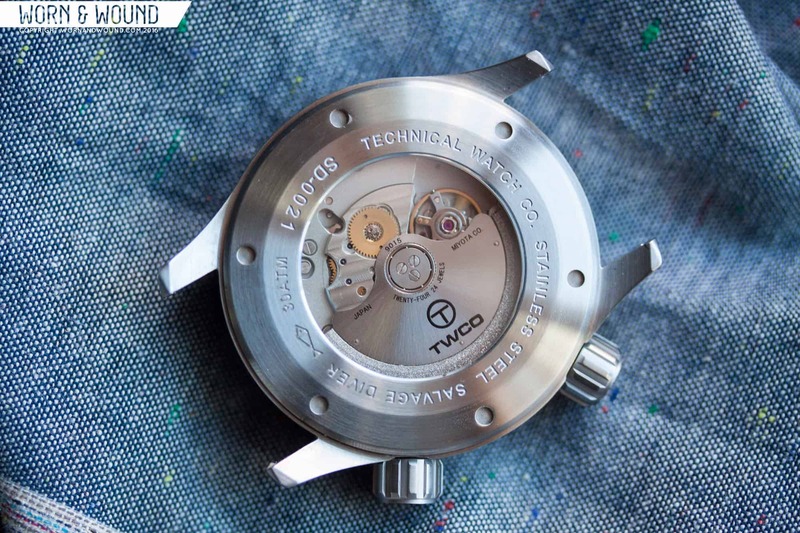 This 26-jewel movement ticks happily at eight beats a second, has a Novodiac shock-absorbing system and will—like the ETA—crack on for 40 hours without another wind. And Hangzhou claims an accuracy of +/-15 sec/day. All in all, remarkably similar to the Seagull TW2130, again, made in China. Any of these movements will tick happily for years to a degree of accuracy that would have astounded our eighteenth century Swiss watchmaker. The idea that anyone could mass-produce to this level of accuracy and quality would have had him reaching for his own tot of Goldschläger. Yet collectors today sniff, raise their eyebrows and pepper watch forums with comments about how they’d rather have an in-house engine. Sure, there are variations of quality and design between each of these “2824-type” movements, but they’ll all do a job and they’ll do it well. They’re practical, reliable, accurate motors. And isn’t that one of the joys of watches—the chance for anyone at any level to enjoy something with a ticking, self-contained life of its own? And if you fancy a Jaguar for Kia money, why shouldn’t you have one?